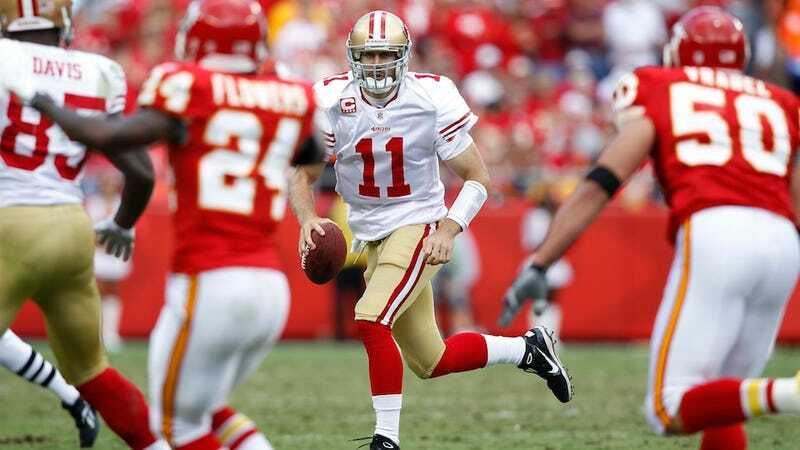 Alex Smith Trade Is "All But Done," But To Where? It's hard not to feel bad for Alex Smith. After years of underachieving in a miserable 49ers offense, San Francisco turned things around. And it looked like Smith had figured things out too—he was on pace for one of the all-time most accurate passing years in NFL history when he was felled by a concussion halfway through the season. That's not why you ought to feel bad for Smith, though a successful player losing his job because he was unable to hide his concussion symptoms raises all sorts of thorny issues. Colin Kaepernick stepped in, played even better than Smith, and the 49ers came within five yards of a championship. No, feel bad for Smith because there's no room for him on a good team anymore, and as nothing but trade bait, he's heading somewhere grim. Like Kansas City! The Chiefs as Smith's new team isn't official, just as any trade can't be official until free agency and trading open up on March 12. But CBS's Jason La Canfora reports that the 49ers have been telling other teams that the deal is all but complete, and both San Francisco and the mystery suitor view it as "effectively done." NFL.com's Ian Rapaport also says it's "all but done," and names the Chiefs as the team that's shown the most interest in trading for Smith (the Jags are apparently not interested). With their hearts apparently set on Texas A&M OT Luke Joeckel with the first overall pick, getting a QB through trade allows them to address their myriad issues through the draft. It's an interesting offseason for quarterbacks, and a team that needs one won't have to reach for another crappy USC bust. Joe Flacco's going to command a giant contract, but it's unlikely Baltimore can let him get away. Tim Tebow's going to end up in Jacksonville, despite Shad Khan playing coy. For all the other teams desperate for a passer, that leaves Matt Flynn—who, like Smith, lost his job not just to a younger QB, but to a new philosophy of QBing.